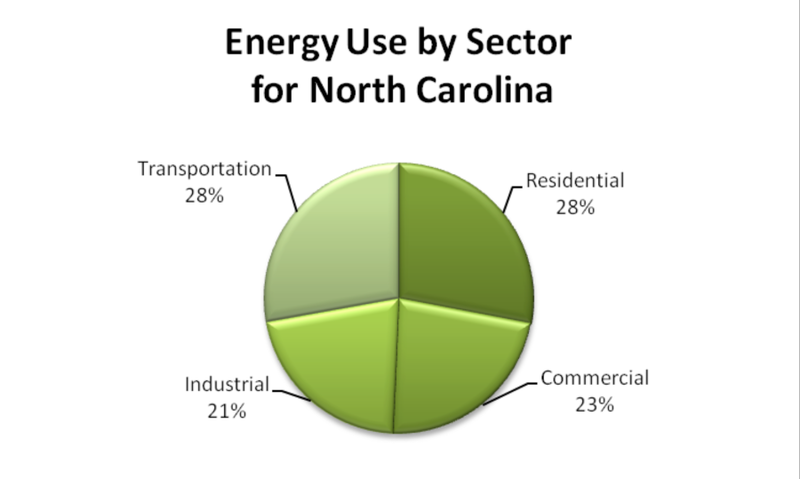 North Carolina has over 9.5 million people, and they have energy needs linked to four main sectors: transportation, residential, commercial, and industrial. Energy use is fairly well balanced between these four sectors. Not as balanced is the supply of this energy. Most people think of energy related to the type of energy they consume – heat for their house, electricity for their lights and appliances, and gasoline for their cars. 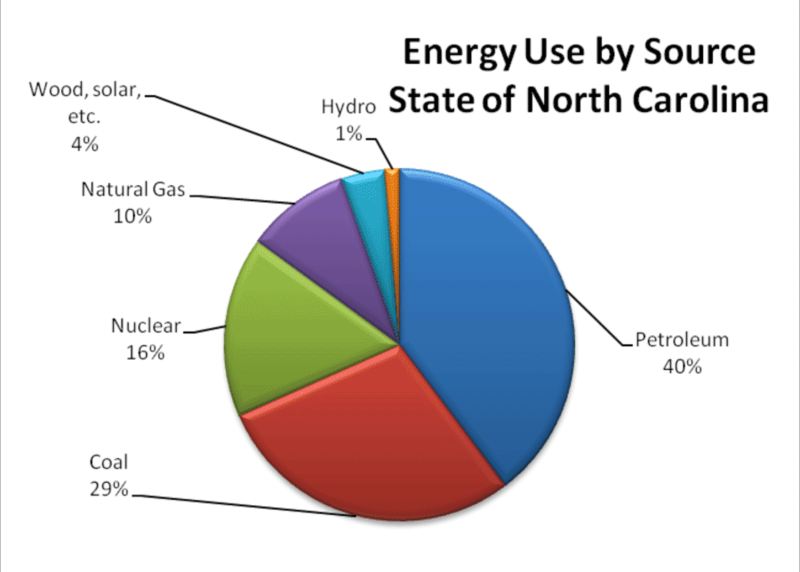 When you look at what generates the electricity or gasoline, North Carolina’s energy use by source is dominated by petroleum and coal. The graph at right shows that our number one source of energy is petroleum. In fact, our transportation sector relies on petroleum for 96 percent of its energy, whether it is gasoline for our cars, diesel for our trucks, or jet fuel for our airplanes. Most of the coal and nuclear power is used to generate electricity. 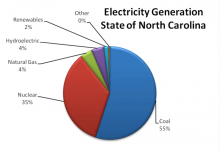 North Carolina has among the highest electricity production and consumption rates in the country. Almost 90 percent of this electricity comes from coal and nuclear power plants. Although North Carolina is one of the top nuclear power producers in the United States, most of this power goes to the larger metropolitan regions around Raleigh and Charlotte. The percentage of power generation in the west is very different than the state as a whole. As of 2008, the Mountain Resources Commission (MRC) region hosted 2,435 megawatts of electricity generation capacity – 8.3 percent of the state’s total generating capacity. Half the region’s generating capacity is powered by coal, about 31 percent by water, and 17.4 percent by natural gas. The region’s counties are home to 39 percent of the state’s hydroelectric power capacity, 9.4 percent of the state’s coal-fired capacity, and about 5 percent of natural gas-fired generation. With no local deposits of coal, petroleum, or natural gas, the vast majority of energy resources for North Carolina’s mountain region must be imported. U.S. government data indicates that electric power generation companies spend an amount equivalent to nearly one percent of the state’s total economic output on fossil fuels mined in other states. Most of the coal is mined in West Virginia and Kentucky, and the petroleum products come in by pipeline from the Gulf Coast. Due to this dependence on imported fuels for our electricity, the MRC region is starting to convert to renewable energy sources. In addition to utility-based electricity generation, individuals and small businesses throughout the region operate about 165 renewable energy systems that produce more than 9,000,000 kilowatt hours per year. Besides substantial hydropower resources, the MRC region hosts plentiful biomass resources in its forests and the country’s southernmost land-based wind power resource. The counties of Ashe, Madison, and Watauga all have local wind energy system ordinances, and the region is home to nine public gas stations offering biofuels. The energy sector is the largest consumer of water, as nuclear, coal, and natural gas power plants require large amounts of water for cooling. 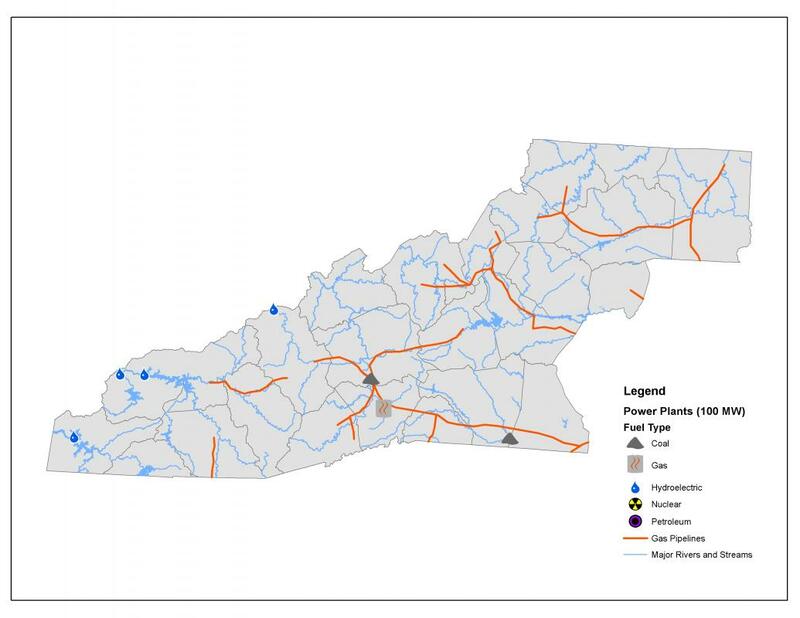 Any future changes to precipitation patterns will have significant implications for hydroelectricity in Western North Carolina. Energy demand and energy costs are expected to increase into the near future in Western North Carolina. A greater share of family income will have to be budgeted for this rising cost, whether it is for gasoline for our cars or heat and light for our houses. Rich Crowley and Paul Quinlan. 2011. North Carolina Clean Energy Data Book. North Carolina Sustainable Energy Association. U.S. Energy Information Administration. 2009. 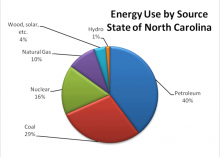 North Carolina Energy Fact Sheet. Accessed from: http://www.eia.gov/state/state-energy-profiles-print.cfm?sid=NC. Land-of-Sky Regional Council EvolveEnergy Partnership Report.